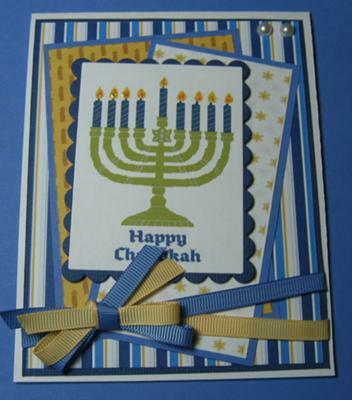 It's so hard in my area to find nice Hanukkah cards, so I looked for some free clip art online and found this wonderful image. I also used some nice new digi papers and made several cards up! Visit Paula's blog, Love Blooms in Me, for more of her wonderful creations! Thank you very much for this gorgeous card, Paula! I'm sure the lucky recipient will love it! I love the layers on your card and the color combination too. That's a wonderful tip you gave about being resourceful and searching online for images that would be perfect to make greeting cards and I can see it turned out awesome for you! Thanks again and I hope you share another card with us soon!